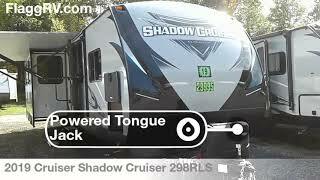 Hi, I am interested in your 2019 Cruiser Shadow Cruiser (stock #93088) listed on Autotrader for $28,995. I'd like to get more information about this vehicle and confirm its availability. The Cruiser RV Shadow Cruiser has multiple floorplans to choose from, whether you and your spouse are looking for a weekend getaway, or you want to take the whole family on vacation, there is a model for you! These trailers may be light in their construction, but they are packed full of helpful amenities, such as a double door refrigerator, LED lighting, steel ball-bearing, full extension drawer guides, and an LED-lit pass through storage allows you to bring along all of the camping gear you may need. With each unit youll also enjoy a power awning with an LED light strip so you can enjoy your evenings surrounded outdoors with loved ones.